I purchased a palette by Lavshuca which PJ has already reviewed here, but I also made swatches. I wanted to take a picture of my wearing it, too, but my eyes look irritated today. (And I still have some vestiges of a huge zit my AHA wash healed. Why am I telling you guys this?) I still want a brown one and will probably buy BR-1 from either the same line or the other palette line that kinda looks like 4 wavy leaves. 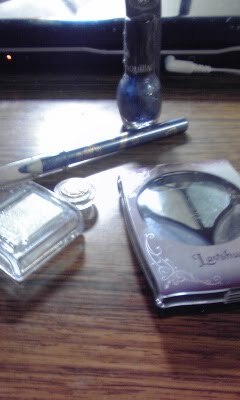 Although I love the colour blue and probably half of my clothes are actually blue (mostly navy blue), I never dared to put blue on my eyes. But now I will! I guess just a dark blue liner (my Mum's daily make-up, btw) or Lavshuca's subtle blue won't look overdone. Enough of my blabbering, off to the swatches! On the top, you can see Lavshuca's Eye Colour Select Palette in Blue, and the bottom picture shows Majolica Majorca's pencil liner and eyeshadow. Do you guys have a special make-up for important occasions? And what do you think about blue on the eyes?